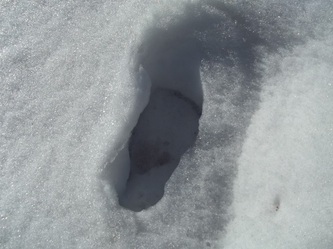 Alberta sightings - Sasquatch Canada contains current and authoritative information on sasquatch and other homins. I of course enjoy reading stories that have taken place so close to me. I wish that I could hear stories of sightings ect here in Edson and area. I can't be the only one. I did however come across one small article of a sighting on one of the hiking trails and recognize the area to be behind my house. Never any follow up. But they are back there this time of year. I have observed this over the last few years, spring and fall they pass thru. I'm sure they are heading into the parks, they are safe there and can avoid hunters. The smell is something else!!! One park in particular I have had a few experiences and others talk of bad feelings and shadows. Last week I was walking one of my dogs out back, I felt something there and Chinooks nose was going crazy, sniffing high in the air. I stopped to scan the bush and heard low growls just off in the bush. It scared me, my first instinct was to run and my first five steps, I swear my feet didn't touch the ground. Last night I took the girls out. I was leary. The bush was stinky and the air was heavy. I walked out to the back feilds and then down the feild making a loop back to the trail and home. Something followed me, at first I was thinking maybe a deer but every time I stopped it stopped but I could hear twigs break on the ground. Second trip with the other dog, we went through the opposite way making a loop. Bad vibes. All the dogs were nuts last night, barking like crazy. 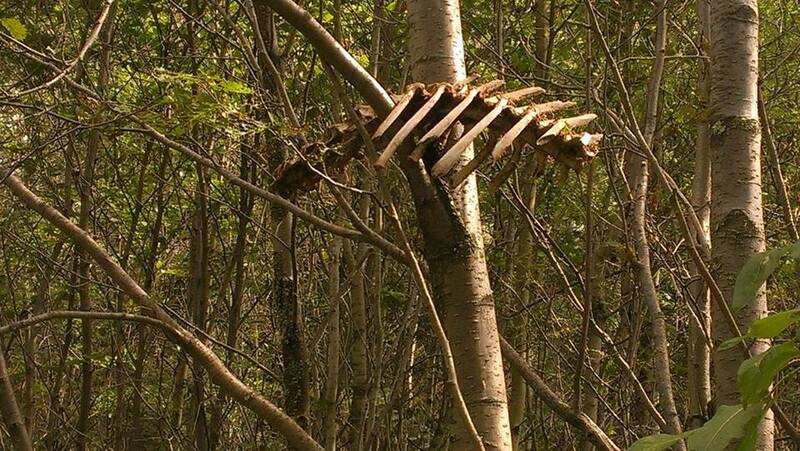 There is also a spine and ribs of a deer placed in the trees just before the entrance to the feilds. In June, 1996, Chief Editor of ANIMALWATCH, Allex Michael wrote of her encounter with sasquatch in volume one, # 10 issue. I thought to copy the article here as I found it one of those more chilling accounts I have read and educational as well. It was a fifteen-minute walk through dense forest to get there from the residence or the road. Bow Valley Provincial Park, an undisturbed protected forest was only a stone's throw away. It is there that my mother, a small dog named Willow and myself were going to retrieve my trunk at three o'clock on a Monday morning. Why three in the morning? I could say it was the heat, but it was mostly because my father had not yet been told that the car would be leaving town. There was also my adolescent fear that knowledge of the platform construction would somehow reflect itself in a summer paycheck I had not yet received. My mother had to be at work by six thirty so we had less than an hour to complete this covert action. As we approached the highway turnoff, a sliver of the moon cast a glowing border around southwestern Alberta's Mount Yamnuska. Driving several miles along the gravel road the camp looked deserted. Summer staff had cleared out several weeks before and a handful of permanent staff were either taking days off in the city or asleep in cabins several miles from the summer campsite. minute skin-scraping bushwhack, but finally we arrived at the isolated platform even though the flashlight batteries were now dead. I assured my mother, all that needed to be done was to take down the poly plastic rain cover and carry back a mattress and the trunk. It should only take two trips. She was noticeably silent as we began working in the darkness. My mother began untying strings securing the poly to the ground and I was kneeling on the top of the four-foot (l.2m) high platform. Stretching up to reach some tangled binder twine knots tied to a tree, a pungent smell suddenly flooded the air. My eyes moved from the knots to the tall length of plastic. There, distorted through the semi-transparent-poly was a huge shadow only about 7 feet (2m) away. With the four-foot platform and me kneeling on top, the creature was easily at eye level. A split second later, there was an incredibly loud screaming roar. Although I know of nothing to describe it, the sound was like a peacock scream, a bear growl and a lion roar all somehow combined. I can't tell you if I screamed. I can't tell you much of anything other than my eyes continued to peer through the plastic at this massive shadow. My five foot three inch (l.6m) tall mother had somehow leaped into the air and was now up on the platform beside me. Whatever it was finally turned and walked slowly away on its long hind feet. We continued watching as each heavy step could be heard contracting the ground. There were no visible ears, just a sparse "Mohawk" like fringe sprouting up from the tapering top of the creature's head. From behind, the upper body appeared massive. It continued to walk upright until disappearing into the trees. We stayed on top of the platform motionless for some time after. Then finally I started ripping down the plastic. I have no idea what my mother did during the next forty or fifty seconds but my next memory was power-walking through the forest! Balancing a single mattress on top of my head with one hand and carrying the handle of the trunk in the other, I assumed my mother was holding up the other end of the trunk. With Willow still hidden under the driver's seat, it was a very quiet drive home. Late at night, they say that your mind can play tricks on you but I am so certain..... Brown bears had been in the area that summer, but I have never seen a bear walk upright that smoothly or for that long a time. Or could it have been a very large, long furred man standing over seven feet (2m) in height? I say man because intuition tells me that the creature was a male. 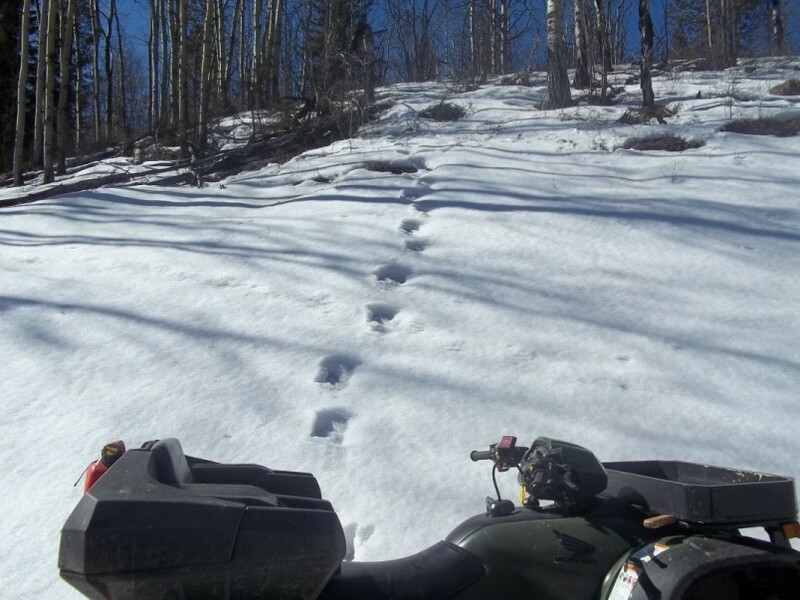 Could it have been a sasquatch that night? I will never really know for sure but you can bet that I will keep telling the story as if it were." This encounter, between four witnesses and sasquatch, occurred in the Province of Alberta, Canada. Steenburg placed the story in a chapter of its own in his book primarily because in the twenty years he had been investigating the mystery of the sasquatch, he said this was the most interesting and detailed accounts he had ever probed. This fascinating story took place in the Crandell Campground located in the Waterton Lakes National Park in the southwest corner of the province. There were two couples with two cars at one campsite. This incident occurred on the Holiday Victoria Day-long weekend of 1988. At approximately 12:50 a.m. at Crandell Lake Campground we spotted a very unusual animal. We were sitting at our campfire when we heard some snorting. We assumed it was a deer, but upon further observation we decided it was a bear and bolted for the cars. The animal was on its hind legs and we switched on the headlights on one of the vehicles. From the shadows, I could see the animal was moving on its hind legs so I called to the other vehicle to turn on its lights. I didn't see a creature but some very clear tracks that obliquely crossed the mud of the North Boundary Trail in Jasper National Park. I was on a solo-backpacking trip into the North Boundary Country in 1987 or 1988 and I had been hiking for about a week and had not seen anyone in this time except mule deer, grizzly bears, wapiti, and many small animals. 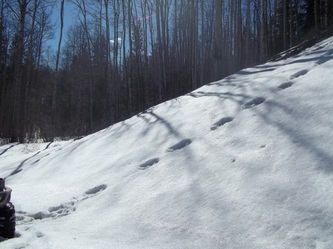 It was very early in the season and I was likely the first person be on the trail that year as I had seen no sign of people previous to me not even any evidence of anyone through nearly five feet of snow on the Snake Indian Pass. Anyway, I think this was just a few kilometers past Twin Tree Lake - I'm not exactly sure of the location) and I was coming out of some heavy bush and going on a slight downward slope toward a boggy area when I came across several large human footprints crossing the trail and going into the bush on the other side heading toward the boggy area. It was probably near mid-day and the weather was warm and sunny and I was a little weary from the heavy hiking; the prints were very fresh (the ridges between the toes being still damp compared to the wetness of the rest of the prints); there was no debris in the prints despite the breeze and debris on other parts of the trail; the prints had probably been made within the previous 45 minutes. They were very human looking footprints considerably larger than my own with five clearly defined toes and evidence of toe movement and what appeared to be dermal ridges and cracks in the skin of the foot: they were hourglass shaped and very much larger than even the grizzly bear paw prints that had been planted over my own fresh boot prints a couple of days before. I took no pictures of these human-like footprints (due to my incredible stupidity). For some reason all I could think of was, "Stupid Park Wardens! Walking around without boots in this kind of country!" 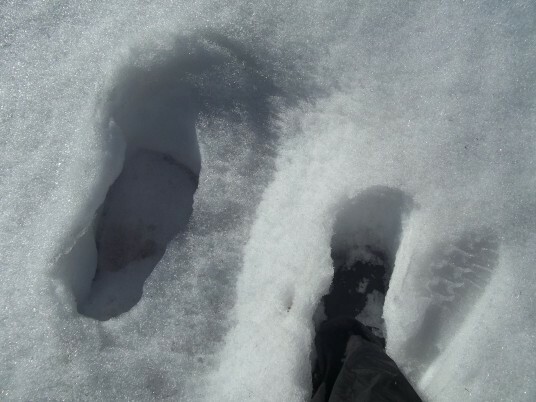 It wasn't until I had walked about another kilometer or two that it occurred to me how immensely silly my assessment of the prints actually were and that I had probably been looking at very fresh sasquatch footprints. That knowledge certainly put a spring in my step to put as much distance between myself and the area that I'd seen the prints as possible. I saw nothing else unusual or uncanny during the rest of the trip. The terrain was heavy bush breaking up into a boggy area. There were mountains all around. I have told very few people and request anonymity. because of the size and dark color but very quickly realized I was seeing something walking on two feet and upright like a human. It was tall but not overly tall as explained by most people who claim to have seen them. I believe it was around the 6 ft tall mark and was rather gangly looking with longer arms than a human that had a definite sway to them as it walked. The creature was moving across the road from one end of the tree line to the other, in what I would call a very fast walk but not running. It seemed to not even notice that my car was coming toward it at high rate of speed (I didn’t see it look towards me). The sighting didn’t last long but long enough to have it kick in fast that I had seen a Bigfoot or what I now call Sasquatch. I was feeling very spooked by what I had just seen and when I got to the spot where it had just gone into the woods on the left of me I was not about to stop. I did have a camera with me in the trunk of my car but there would have been no time to get a picture in the situation given even if I had decided to try to get a pic. Upon coming back home a couple days later I traveled back through the area with eagle eyes and saw only deer mind you it was about 2:30pm, not the same time as before. I have traveled this area alot and never noticed anything like this. I did a little looking around on the net in the last few weeks and have learned alot about these animals, I also submitted a report to Oregon bigfoot but only because it was one of the first sites I came across and they have never contacted me even after leaving my phone # and e-mail just 4 days after this all occurred. I would like to learn more now and even go into areas were these animals are said to exist. I would also like to know if these animals stay within the general area were they are seen??? The area this sighting was made in is very remote and there is thick forest as far as the eye can see, I would like to explore this area more. OBSERVED: To start with we don't know exactly what it was we saw that night. However we both saw it and after finding this site and reading some of the sightings we now belive what we saw was possibly a Big Foot. We were driving down the highway, it was dusk. There were lots of shadows due to the time of day. We pulled over to take a picture of some wildlife and the mountains. The wildlife didn't mind us they kept on as they were. After about 20 minutes of talking and watching we heard a terrifying scream/howl. It wasn't like anything we had ever heard! Definitely not human or any other animal call we have ever heard. All the wildlife left as thought they were startled. We decided it was time to leave as well, if the animals were that spooked by the scream/howl then we thought it would be best to leave too. Just as we got back into the car we heard the scream a second time. We began to drive away slowly (gaining speed) and talking about the scream. My husband looked into the rear view mirrors and saw some birch trees waving back and forth I then looked as well. Then something came running out of the tree line it stopped and looked at us for a moment and then with what seemed like great speed and maybe 2-3 leaps crossed the road and was gone into the trees again. It was definitely on two legs and covered in dark hair. We were only about 25 feet away when it came into our view. Although I cannot say for sure what it was we both saw it and have never seen anything like it before or after. It seemed to have great Height and speed. Far to quick to be a Human but definitely had the body structure of one. Needless to say we got out of there quick! Activities of Witness: Watching elk graze and talking with each other. Taking the odd picture of the Elk. Car was turned off while we were there. Description of Creature: It was about 6-7 feet tall, dark in color. Seemed to covered in hair from head to toe. Too far away and lighting was too poor to see any detail. Other (Informational or Encounter History in the General Area) Notes: I have read of some encounters near and around Mt. Robson British Columbia. We were about 3-4 hours from there on Alberta side of the Rockies. Other than that I am unsure if there have been any other sightings in the area. Additional Notes and or Follow up Comments: After reading the report my husband realized I had forgot to mention the odor we noticed in the air. There was a slight breeze and it was carrying a foul smell almost comparable to body odor. We hadn't paid any attention to the smell thinking it was probably just the Elk. Although it did seem to have gotten stronger closer to the time we decided to leave. OBSERVED: My uncle and I were going home after visiting cousins. Suddenly, my Uncle stopped dead in his tracks. The few dogs of our cousins were giving off a low growl/whimper kind of noise as if they couldn't decide what to do. My Uncle pointed to two figures that I could not see. I had to get glasses and I tried very hard to squint and figure out what my Uncle was looking at. He turned as did I, to run back to my cousins place. My Uncle was so scared that he jumped over a fair sized fence while I crawled underneath. Later, my Uncle asked me if I saw the figures that he was pointing to. I said no and then he told me what he saw. He saw to black figures. One was significantly smaller then the other. they were standing near a house that was approximately between our house and my cousin's place. The dogs came running back to the house as well, not bothering to invesigate what these creatures were. OBSERVED: IIwent out side to get the mail, I was probably eight. There was a sudden noise in the woods next to my yard, I heard twigs snapping. I looked at the woods and saw a huge, dark creature. It looked like Big Foot and that's what I thought it was. It started walking further away from me, it walked on its hind legs! I ran like heck back into my house. I told my mom about the creature and she told me it had to have been a bear or something. But I know it wasn't because bears don't walk on their hind legs and there's never been a report of a bear in those woods. ACTIVITIES OF WITNESS(ES): Walking outside to retrieve the mail. DESCRIPTION OF CREATURE: A huge, dark creature , looked ape-like that walked on it's hind legs. OTHER NOTES: Two weeks after this happened to me, my older sister was having a sleep over and they were planning on sleeping out in the yard. But one of her friends saw something big and ape-like nearby, needless to say they didn't sleep outside that night. My dog was found dead and it looked like some nasty creature killed her. OBSERVED: I was getting up early to hit the mountains up in XXXX. so I went out and started my car. In 5 minutes I left my cabin to the car and I was driving down an old gravel road just north of XXXX. It was just starting to get lighter outside and I saw something was on the road. I slowed down a bit and suddenly I slammed on my brakes. I was aprox 30 maybe 40 feet away from him.I have been waiting all my life to see one and I finally did. I was excited and kind of scared, I didn't move a muscle it was like he was watching me observe him. He was brownish with a blackish mix, about 7'1" I would say and close to 500 pounds. pulled up right beside him and stopped.. He panicked and got up and ran into the bush. OBSERVED: I saw something mysterious two times in my life. First was when I was about 9 years old. I was waiting for the bus on the road, about 100 yards from my house. I was throwing rocks and waiting patiently for the bus to come up a hill. As I was looking in the direction of that hill (about 200-300 yards away), I saw what I thought was a man or boy running across the road from right to left. I thought it was the one of the boys playing tag that lived about a half mile down the road where the bus was coming. When I got on the bus the first thing I asked was if those boys were playing atop that hill near where I lived. They said "No." Years later I began to question who would be running across a wooded area that early in the morning (about 7:00am). The houses were pretty far apart and there was plenty of wooded areas where I lived. Another time when I was about 12, two friends and I were headed home in the late evening. It was summer but where I live in northwestern Alberta, the sun stays up long in the summer. We were coming up a hill and although it was dark, I could still make out the shapes of trees and stuff. We were walking along and I was on the left hand side as we were headed in a west direction along a dirt road. We were talking when I noticed something in the ditch to my left. As we were walking by it I didn't want to look directly at whatever it was. I didn't want to tell the others or scare or panic them or myself. As we walked by, my body was like in auto pilot as we kept walking. I looked thru the corner of my eye. I saw what appeared to be something lying on the ditch, very still. It was dark and the one leg was bent more then the other leg, as if it was trying to blend with the grass and darkness. I walked faster but didn't run because I didn't want whatever it was to chase us. I never told those other two boys about it. Maybe they saw it too. One day I will ask them. windows, a huge man looking in the window at night. There were other stories and another mysterious encounters. DESCRIPTION OF CREATURE: In the first sighting the creature was running, looked slow but covered lots of ground. It appeared like it was trying hard not to be noticed. and appeared to be hairy. The feet looked long and narrow. There was no smell or maybe I was just in a state of shock. It was as though the creature was very adept at blending in and hiding. It was January 1991 and I was south of Valleyview, Alberta Canada about 10 pm with a co-worker in the woods. We were crossing a bridge in our truck, and when I looked down I saw a large, black, being marching across the frozen river. It was swinging its’ arms. I knew it wasn’t a man because of its size and color. When I told people what I saw they just laughed, but I know what I saw was Bigfoot.